The exhibition will remain on display throughout the month of November. Check out The Soap Factory's website for gallery hours and information. Appropriation is an important historical practice in art-making, in which the artist uses a previously existing form, image or sound in new ways. The creative effort is defined by the inspired selection and manipulation of found materials. The end result is a strangely familiar, yet altogether new creation. 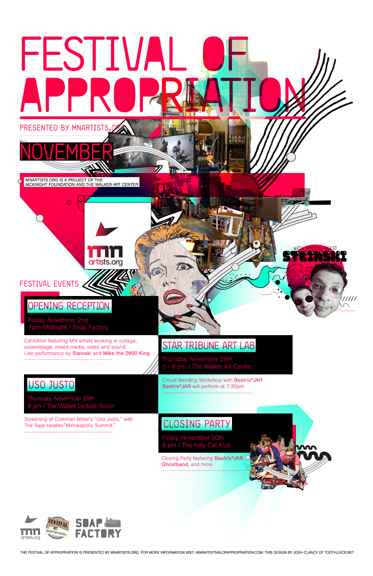 The 2007 Festival Of Appropriation will bring together over a dozen collage, assemblage and mixed media artists from Minnesota, celebrating the art of appropriation. The event will feature an exhibition at The Soap Factory, featuring a performance by STEINSKI (November 2), and a film screening at The Walker Art Center (November 29).